Let the Festivities begin! I have put away my wire & wool & fabric & glue. I have got most of my decorating done. I'm starting to think about what I should buy everyone for Christmas. I am ready to Get Ready. I've squeezed in a few Christmas events already and am looking forward to some more happy get togethers this week. 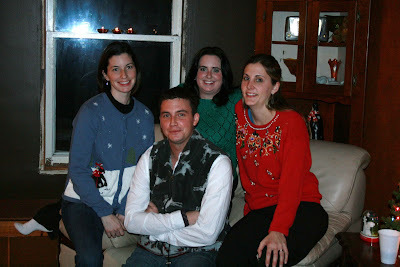 Today was our Scott Christmas at Brian's brother, Steve's. Last year, when there was talk about Christmas Eve, Scotty wondered if we were going to 'Christmas Steve's again'. We enjoyed Christmas Steve today, or what we fondly call 'Festivus for the Rest of Us'. There was no way of replacing the wonderful years of Christmas we had on the Scott farm, so we invented our own tradition. No fuss, no muss, no cooking - just getting together for pizza. 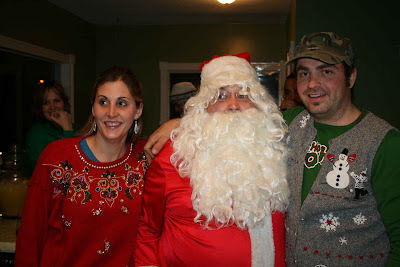 Last night, Ashley and Andy christened their new home with a Tacky Christmas Sweater party. 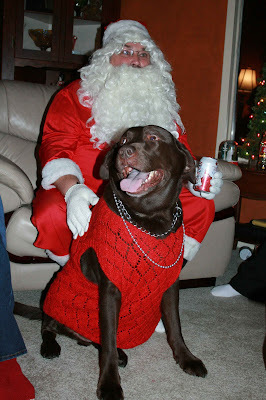 Even Askhim the Dog participated. I think that I should have won a prize as I didn't have to go to Goodwill or Sally Ann for something to wear - I just went to my own closet. And it won't be the only time I wear it this season. It was a fun & fitting housewarming for my crazy clan. They all certainly do know how to have a good time. Nothing makes me happier than seeing my four together, enjoying each other's company. They have almost come to accept the compulsory photo & take the 'lets just get it over with' approach to humour their old mother. It's the greatest gift that they can possibly give me.